3D scanning of museum collections is an awesome use of 3D technologies that provides a way to share rare items with the world. 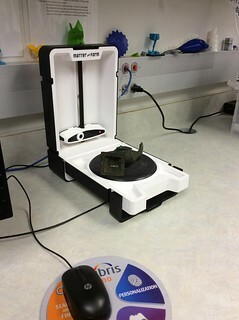 Many museums and libraries have been sharing 3D scans of their collections, leading to an amazing selection of historical artifacts that can be viewed in a web browser, virtual reality headsets, and often even downloaded and 3D printed. Many can be found in Sketchfab’s collection of Cultural Heritage and History items and Scan the World’s collections in Myminifactory. 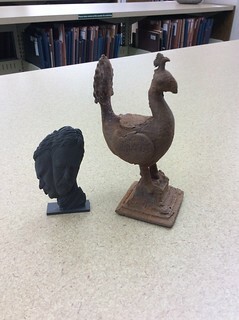 This summer, we did a little experiment with 3D scanning an item from the collection of the Lawrence University Wriston Art Center Galleries. 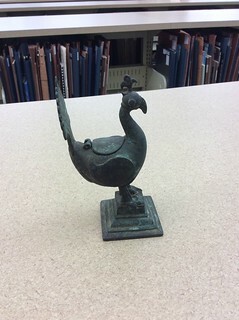 The original object: A 5.75 inch tall bronze inkwell from India. Third scan of the peacock, lying on its side. After cleaning up and merging the scans, we exported the file as an stl and prepared it for 3D printing in Cura. 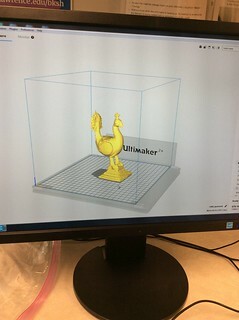 Peacock file in the Cura slicing program. We printed replicas in two very different Proto-pasta PLA blend filaments, both using an Ultimaker 2+ 3D printer. First in Cupid’s Crush Metallic Pink HTPLA. Then we printed another using the Magnetic Iron Composite PLA. This filament can be hard on a print nozzle, which is why we were sure to use the Ultimaker 2+ printer. The 2+ nozzles can be fairly easily swapped, and only cost $11 to replace. In addition to being magnetic, the iron blend is also rustable. We took the peacock print home for the weekend and used a solution of white vinegar, hydrogen peroxide, and table salt to try to give it an aged, rusted look. We coated the peacock with the solution, placed it in a sealed bread bag, then left it outside in the sun for the afternoon (shaking it occasionally to recoat the object in solution). Full instructions for this process can be found here, Improved Rusting Method for Iron Prints. The final product was pretty impressive, and looked more like something we dug out of the ground than something we had just 3D printed. 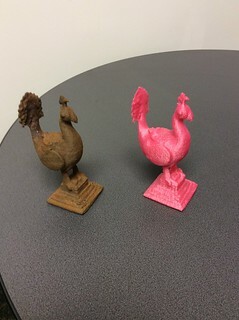 Peacock with one of Rob Neilson’s Teddy Box objects printed in the same filament that had not been rusted. The two replicas together (in different light than the other photos). Big thank you to our friend Beth Zinsli in the Wriston Art Center galleries for letting us scan one of the collection’s objects. 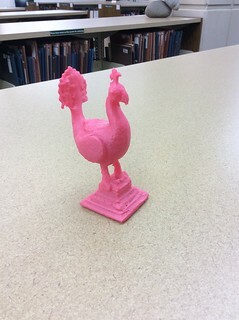 This entry was posted in 3D Printing, Art History, Assignments, Museum Studies and tagged 3D Printing, 3D scanning, makerspaces and art, museum collections, Virtual Reality on August 24, 2018 by Angela Vanden Elzen.